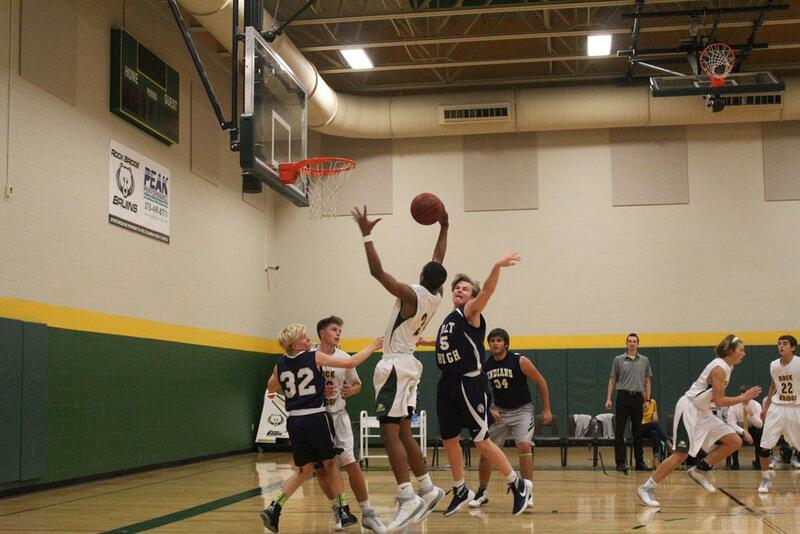 Yesterday at 6 pm, RBHS Boys Basketball played host to Holt. Within the first six minutes of the first quarter, the Bruins managed to take a 13 point lead by a 14-1 score. After winning a crucial home game against East High School Bears on Tuesday, Dec. 15 earlier this week, the boys’ basketball team was feeling confident coming into Avila University Dec. 18 to play against St. Thomas Aquinas High School. However, the Saints unexpectedly defeated RBHS 54-46 in the showcase, and the Bruins left Kansas City with a 4-2 tally for the season. One of the main factors resulting in the Bruins’ tough loss was insufficient care of the ball, resulting in several points on the other end for the Saints. From the beginning of the first quarter to the final seconds of the fourth, St. Thomas kept a slim, yet comfortable lead which eventually granted them the win. Despite their costly turnovers, RBHS had adequate performance in other aspects of the game. The team thoroughly fulfilled the offensive role, in which freshman guard Ben Cooper lead the team with 14 points for the night. Cooper also believes that teammate inexperience is a factor in the few losses the team has faced this year. The team’s first loss of the season was on Friday, Dec. 12, in which the DeSmet Spartans defeated RBHS 47-31, and tonight marked the second loss of the season for RBHS. The team is now looking forward to their next game, which will take place on Dec. 22 at Battle High School against the Spartans. RBHS defeated the Spartans in a preseason scrimmage on Nov. 20 and they are looking forward to come up with another win against BHS. Will you be attending the team’s next game on Dec. 22? Leave a comment below and let us know.